The other person stares at me blankly. I sigh. I find myself repeating this conversation often. Since my husband is an Army chaplain, I meet Christians of many stripes who frequently ask about our denomination; they’ve heard of Baptist and Methodist and Lutheran, but oftentimes aren’t as familiar with the Christian Church (Disciples of Christ). I love taking the opportunity to share about this denomination and about my church. And that’s why THIS red cup matters. The red cup means that I am home. Brand recognition matters. Driving through a new community, a sign that says “Christian Church” could mean almost anything. 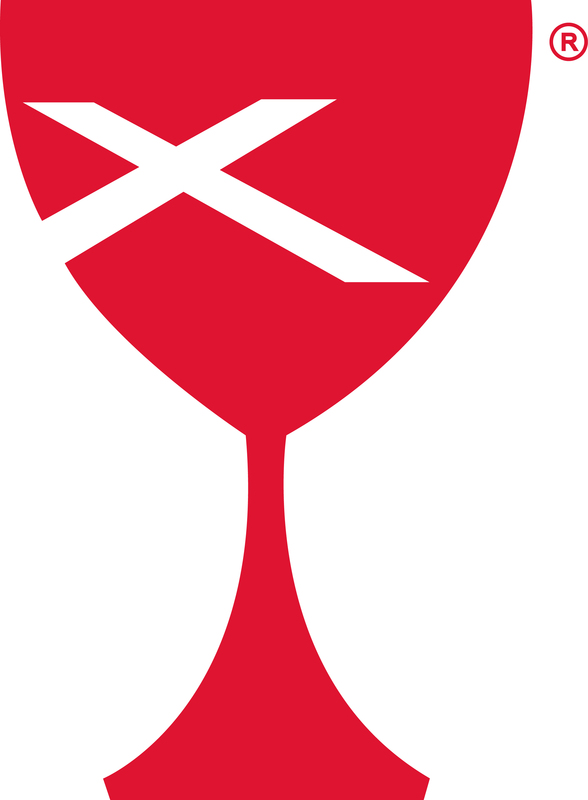 But when I see that little red chalice with St. Andrew’s Cross? I know I’m home. As I’ve written before, my husband and I have only been Disciples for about six years now, and making this shift was an intentional and prayerful decision. We’ve been to Disciples churches all over the country, and each is remarkably different. And yet, in each, we are welcome; in each, we worship God together; in each, we celebrate communion every Sunday; in each, we are home. We are diverse, we are faithful, we are God’s people but not God’s only people. We are the Disciples of Christ: People of the (Red) Cup. Jonathan and I just returned from our first ever General Assembly of the Christian Church (Disciples of Christ). It is a gathering of clergy and laypeople from throughout the denomination for five days of learning, reflection, reunion, worship, and – of course – business. There were fewer people at this Assembly than ever before, and that was not lost on anyone. But for me, it isn’t. Jonathan and I were both raised in other (much more conservative) denominations. For us, being members of the DOC was a decision we came to intentionally and with much thought, conversation, and prayer. We had gotten to a point at which we knew we could not faithfully stay in our previous traditions and found a home in the DOC that we had never felt anywhere else. We first began attending Disciples churches in 2008, became a member of a church in 2009, and Jon’s ordination was recognized by (transferred to) the DOC in 2010. I am a licensed minister in Kentucky while I complete my MDiv through Lexington Theological Seminary and work part-time at a local church. I understand the grief and loss that long-time Disciples must be feeling, because I have felt it about other organizations and such in my own life. But for me, if I hadn’t been told – repeatedly – that we’re in decline, I wouldn’t have believed it. I would have guessed that there were only 3000 people at the last assembly and we’re growing! I would have felt the energy in the room and sensed a moving of the Spirit that is indicative of a group ready to soar. I had to read a book for an introductory seminary class about the “shifting” culture that impacts the church. The book presented these areas: lack of trust in authority, lack of trust in institutional church, etc. – as shifts that are currently taking place. But for people my age, they are history. I have never known a civil religion. I have never known a world in which church attendance was culturally expected. I have never known a time when “spiritual but not religious” was not accepted as valid. I feel the same about the Disciples. As a new-ish Disciple, this IS normal. It’s not a NEW normal. This is what I signed up for. When Jonathan and I made that intentional, deliberate decision to join the DOC, we knew it was in decline as were all mainline denominations. We knew there had been disagreeing factions – and we knew that’s okay. Sure, there’s a lot we have learned, discovered – and critiqued – about the denomination in the last few years, but for us, the Disciples of today are all we have ever known. I experienced a group of people who care about and love the church. They are not committed to traditionalism but genuinely want to help people encounter the Divine. I experienced a group of people who are open to new ideas and ways of doing ministry. I experienced a group of people who do not draw hard boundary lines around who’s in and who’s out. This makes discussions messier than in other denominations, but its inclusivity is its strength. And because of that, I experienced a group who is better poised than any group of Christians I know to meet the challenges of this and future generations. I experienced a group of people who is able to laugh (#CampbellCon, anyone? ), is heartbroken at injustice, and whose lives have been transformed by their experiences with and understanding of God. I experienced a group who cares so much about this denomination that nearly four thousand people came from far and wide to be together. FOUR THOUSAND. That is not a small number. I experienced a group diverse in race, gender, ethnicity, orientation, and age. Let me focus on that last one a bit: age. When I looked around that room at all the under-40 clergy in attendance, I do not see a denomination that is going away! While it might look differently in the coming decades than it does now, I’m already making plans for General Assembly 2051. I get grieving. I get naming the loss in order to move on. It is a sign of a healthy group when loss and grief can be named and integrated, and I’m glad to be in a denomination that allows that emotional language. But for me? I’ve found my tribe, and I’m committed. I’m committed to joining the conversations, I’m committed to serving the people in the church so that those people can go be the church in the world. I left General Assembly feeling hopeful, inspired, empowered, and encouraged. I left confident that joining the Christian Church (Disciples of Christ) was one of the best decisions I’ve ever made. In the early days of Christianity, small groups of people met in homes to read Scripture, pray, and celebrate the Lord’s Supper. We invite you to remember Ash Wednesday in your homes, either in personal reflection or with your family. Ash Wednesday is a time we reflect on our sinfulness and our need for connection with God. The 40 days of Lent mirror Jesus’ 40 day fast in the wilderness, culminating with Eater. Traditionally ashes are made from burning the previous year’s Palm Sunday leaves. The ashes are a sign of sin’s disfigurement and of our own mortality. You are invited to make the sign of the cross on your foreheads or hands, even without the use of ashes. The following is adapted from Chalice Worship and includes a meditation by Rev. Nathan Brown, the Senior Minister at First Christian Church of Hopkinsville, Kentucky. Leader: The day of the Lord is coming! The day of the Lord is near! People: The time is fulfilled! The reign of God is at hand! Leader: O people, repent! Believe in the gospel! People: Come, let us turn and follow the Lord! Friends in Christ, we begin a forty-day journey toward Easter. to welcome the risen Christ with lives renewed by the breath of his spirit. We assume a discipline of self-examination, confession, and penitence. We dedicate ourselves to meditate upon the scriptures and to converse with God in prayer. by the one whom we confess to be Lord and Savior of the world. To this end let us worship God. Which, I think, is the reason getting rid of dust is a multi-million dollar industry. As individuals, we spend hundreds of dollars every year to rid the dust of our lives, buying swiffers and brooms, vacuum machines and dust-busters. Dust is a nuisance. It gets in the way. Mostly because it reminds us of our finitude—that we are imperfect, molded from the earth. Thus, we would rather sweep it into dustpans, under the rug, and off the back porch. We don’t like this reminder. We prefer the lure of immortality. What, then, in your life needs to return to dust, in order that you might live? Do you need to let die selfishness or greed? Are you being called to put to rest a prejudice or bias? Do you need to bury an anger or resentment? What about an addiction or an obsession that keeps you from living more faithfully? The English word “dust” actually has its roots in the Hebrew word, “Adam,” which is what God calls the first human created in the garden. So, while we are made of dust physically, we are also made of dust theologically. Physical dust is what binds the molecules and atoms that make up life and theological dust is what holds together our faith. At least, this is what we will experience again in Jesus of Nazareth over the next six weeks: only in death can there be new life. let us pray to the God of mercy. Hear our prayer, O God. Merciful God, the ashes are our pledge to take up the cross of life. We came from the earth and we will go back to it. we will try to live here and make it a better home for everybody. to reconcile all things, whether on earth or in heaven, through Christ alone. make your spirit’s cleansing fire burn within us. Lift us from the dying embers of our inattention. Mark us with the sign of your holy passion. Make us ready to respond to the call of Jesus Christ.